Create the illusion of etched and sandblasted glass at a fraction of the cost. Create your own pattern or choose from our many in-house designs. Innovative patterns. As tastes change, so can your designer window film! Complement furnishings, wall coverings, carpeting and window treatments. Designer films can be replaced at a fraction of the cost of new glass. White Frost: A semi-transparent film designed for windows where sunlight is desired, but total day and night privacy is needed. & can also be used to create custom film designs. 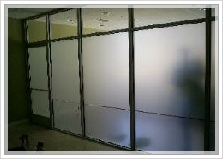 Whiteout & Blackout Films: Opaque white and black window films developed to create total privacy. Excellent for eliminating views inside a window or glass area. View Control Films: Lumisty view control films give you the ability to determine what can be seen and what can't through the glass. The glass can be transparent from one angle and translucent from another angle allowing you to control how people see through the glass (available in different levels). Custom Color Design & Patterned Films: Cracked Ice , Iridescent Film Blue/Violet/Red, Atlantis Mosaic, Cut Glass Atlantis, Cut Glass Stones, Clear Icicles, Clear Cut Glass Flowers, Cut Glass Floret, Cut Glass Bubbles, Cut Glass Pebbles, Cut Glass Prism, Cut Glass Facets, Cut Glass Gems, Cut Glass Mosaic, Cut Glass Crescent, Matrix White Matte, Matrix White Clear, Matrix Olive Matte, Matrix Blue Matte, Matrix Harvest Gold Matte, Gossamer, Transparent Rice Paper, Translucent Rice Paper, White Rice Paper, Fiberglass, Shoji Screen Rice paper, Frosted Bamboo, Clear Obscure Light Gossamer/ White Interlocking Squares, Matt White Milky Solid, Dusted Crystal, Dusted Crystal (acid etch look), Dusted Leaf, Transparent Leaf, Frosted Sparkle, Frosted Crystal (Sand blasted look), White Matt, Bronze Matt, Silver Matt, Charcoal Matt, Gold Frosted Sparkle, Fine Gold Etch, Snow White Light Diffuser, White Out, Black Out, Total Light Blockout, Satin Silver Opaque, Green Blurry View, Blue Blurry View, Yellow Blurry View, Orange/Red Blurry View, Milky Sand Blast, Brimstone Sand Blast, Blue Swirl Sand Blast, Green Sand Blast, Golden Yellow Sand Blast, Orange Sand Blast, Periwinkle Blue Sand Blast, Frost Mint, Frosted Rose, Frosted Mint, Frosted Blue Mist, Milky White Frost, Grey Frost, Bronze Frost, Light Etch, Deep Etch, Clear Lustre, Acid Etch (Blue Paper Liner), Clear Frost, Clear Frosted Safety Film, Fine Cast Sand Blast, Clear Sand Blast, Clear Crushed Glass, Hazy View, Rain Glass, Clear Sheet of Ice, Clear Ice, Amber Ice, Blue Ice, White Ice, Grey Ice, Fine Seeded Glass, Fine Brushed, Clear Morning Freeze, Ice Frost, Clear Ripple Glass, Clear Crystal Ice Chip, Iced Velvet, Big City Lights, Clear Western Floral, Clear Tapestry, Clear Four Seasons, Clear Shattered Glass, Clear Waters, Clear Aurora, Clear Diamond, Clear Crystal, Obscure Glue Chip, Clear Feathered, Clear Sea Shells, Clear Fan Tail, Clear Brushed Diamond, Clear Lens (small squares), Clear Lens (large Squares), Clear Lens (extra large squares), Frosted Rectangles, Frosted Squares (mini), Frosted Squares, Clear Frosted Squares (mini), Clear Small Frosted Squares, Frosted Square Squares, Clear Frosted Squares (extra large), White Squares, White Squares 3/16” Clear (large), White Matt Squares 3/16” Matt, Frosted Squares 3/8” Clear, Frosted Stripes 1/8” Clear (thin), Frosted Stripes 5/32” Clear (thick), Frosted Stripes 3/8” Clear (extra thick), Clear Frosted Stripes, White Stripe /Clear Combo (thin) in Vertical & Horizontal, Silver Etched Stripe 3/16” Clear (thin), Silver Etched Stripe 1/8” Clear (thick), White Stripe Venetian Blind 1/8” Clear, White Stripe ¼” Clear, Frosted Short Stripe Mini Blind, White Frosted Mini Blind, Ice Galaxy, Dove Stained Glass, Fish Stained Glass, Abstract Stained Glass, Silver Opaque, Galvanized Metal, Diamond Deck Plate, Brushed Metal, Metal Lens (small), Metal Lens (large), Metal Linen. Custom Vinyl Lettering & Graphics Also offering Custom Vinyl Lettering & Graphics! We install custom store front graphics including lettering, design/ logo cut outs on white frost and custom boarders. If you are not sure what will look the best, let us help. Our expertise will allow us to find a perfect solution. Call for your Custom Job Now. Decorative Window Film is a beautiful way to protect your privacy. We offer a wide variety of Decorative Window Films whether it is for your Home or Office, OC Tint Shop Inc. has the Custom Film for the Custom look you are looking for. Our exclusive line of films offer the privacy you get with expensive glazed frosted etched glass while being a more cost effective alternative Saving You Money. We offer a variety of Custom Colors, Textures & Patterns which work perfect with both Interior Glass and the Inside Surface of Exterior Windows, for both Residential & Commercial Glass with a 5 Year Warranty for Commercial & Residential use. Our Decorative films Add Privacy, Enhance Design, Increase Safety, Reject UV, Cut Glare & are Easily Maintained. Call our Office Now for a Free On-Site Consultation & Free Film Samples.